My cousin, Adora's, easy pie crust recipe, changed my pie baking from disastrous to successful. 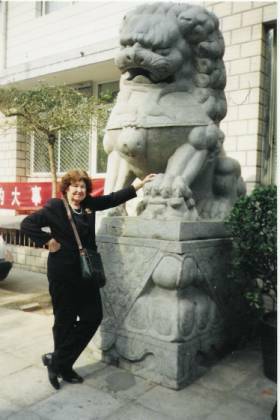 the pie crust lady traveling in China. Back to the pie crust... Whether you are in Norway or somewhere else in the world, baking well is a "good thing". 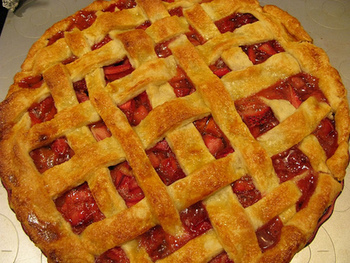 The first time I made apple pie, I had found some recipe and did a lot of guessing - the result was a disaster. I had flour all over the kitchen and I was very frustrated and discouraged. Also, I didn't know what to add to the apples. After experimenting with cream to make it "extra" good, I sprinkled a lot of sugar and cinnamon on the apples, but what I made was not an apple pie - still haven't figured out what I made. If you want to make pie, you might want to try this no-fail crust recipe. It can be used for chicken pot pies as well as for making quiche. Makes 2 pies with cover. Sift flour and salt together. Cut in shortening or butter. Mix beaten egg, water and vinegar and combine gradually with flour mixture. Chill pie dough in the refrigerator. Cut it into four parts; place onto a floured, non-stick baking surface or pastry board and put your rolling pin to work. A nice benefit is that this pie dough will freeze well. So, next time you want to make pie, your easy pie crust dough is "ready to roll".